Last time we discussed several different approaches to building Vardos, but this time I want to talk about alternative uses for Vardos and Wagons. One of the first years that I attended Pennsic, I remember seeing a trailer in someone’s camp. The trailer had been decorated to look sort of like a post and beam building. I eventually found someone to ask what it was used for. The answer? A kitchen. Since then I have run across several larger encampments that have a kitchen trailer. I was told that this wagon, at Pennsic this year, is a kitchen. Unfortunately, I was going somewhere at the time and didn’t have a chance to see if I could get a tour. 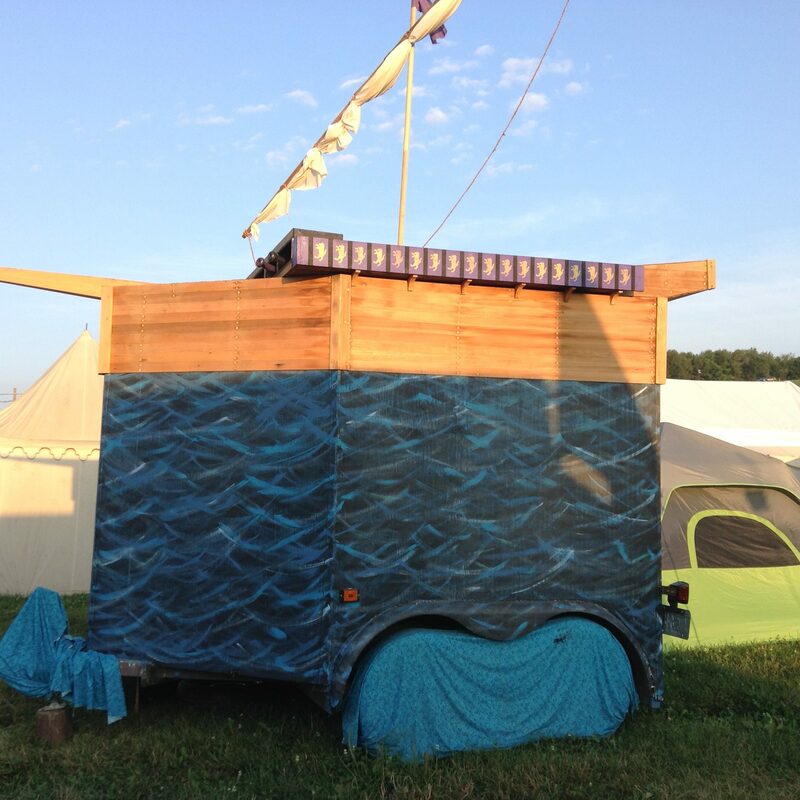 The second most common non-living quarters use for trailers that I have seen in Pennsic camps is shower trailers. I had seen this trailer from the road one day, and popped my head into the camp to see if anyone was home. A gentleman there graciously invited me in, answered my questions about the trailer, and even allowed me to take pictures. Here is a picture of the trailer from inside of the camp. The first section of the trailer is a washroom with a sink, counter and garbage can, and plenty of room to change clothes. 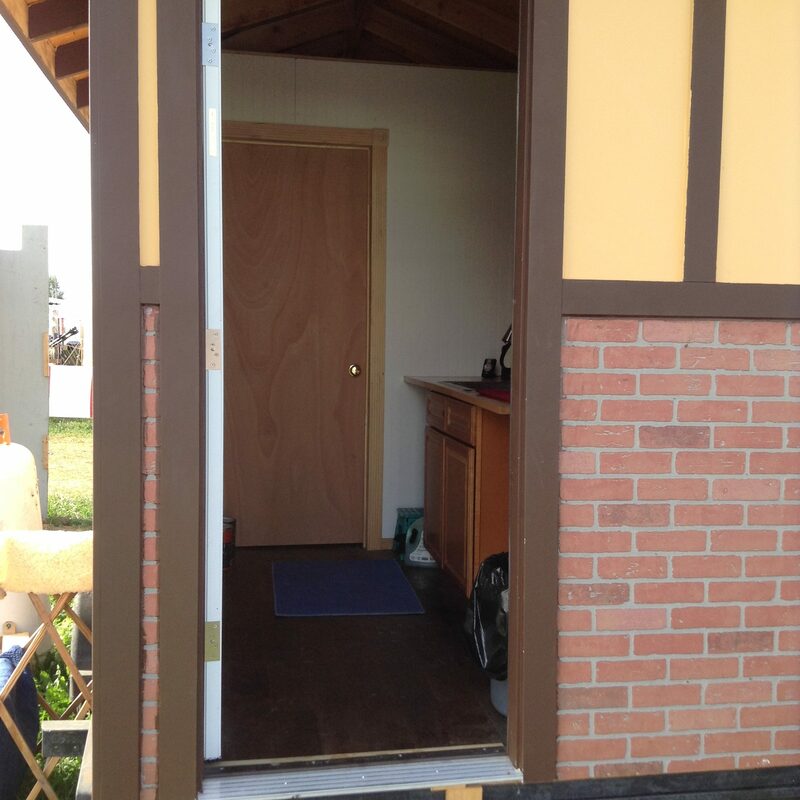 The area behind the door is a shower. Now for people that have never been to Pennsic this may all seem a bit confusing, or over the top. A friend who had never camped in a proper household at Pennsic went this year. He said on facebook that he was told that the camp had a shower. He expected what we call “bag o’ mud”. Water heated in a solar shower bag – i.e. a five gallon lukewarm shower. What he found instead was a real shower with a propane hot water heater, and a sump. Pennsic is one of those locations where it is permissible to dig a sump for kitchen and bath water. In the case of the shower trailer that I just mentioned, they simply run a pipe from the shower to the sump. In the case of our household, which is a much smaller camp, we share a shower with our neighbors. We give them a little land and they have the pop-up with custom walls, The young men dig a sump, we have a pallet that goes over the sump, they have a hot water heater, and we provide the propane for the heater. A hose runs from the water spigot to the hot water heater, the shower, and the kitchen sink, which is outside and is used for washing dishes. The sink drains into the shower sump. One of the old households that we belonged to had four showers, with a sump and a kitchen sump with a sink. There were about 24 tents in that camp, and everyone was crazy busy teaching, and running the archery range. 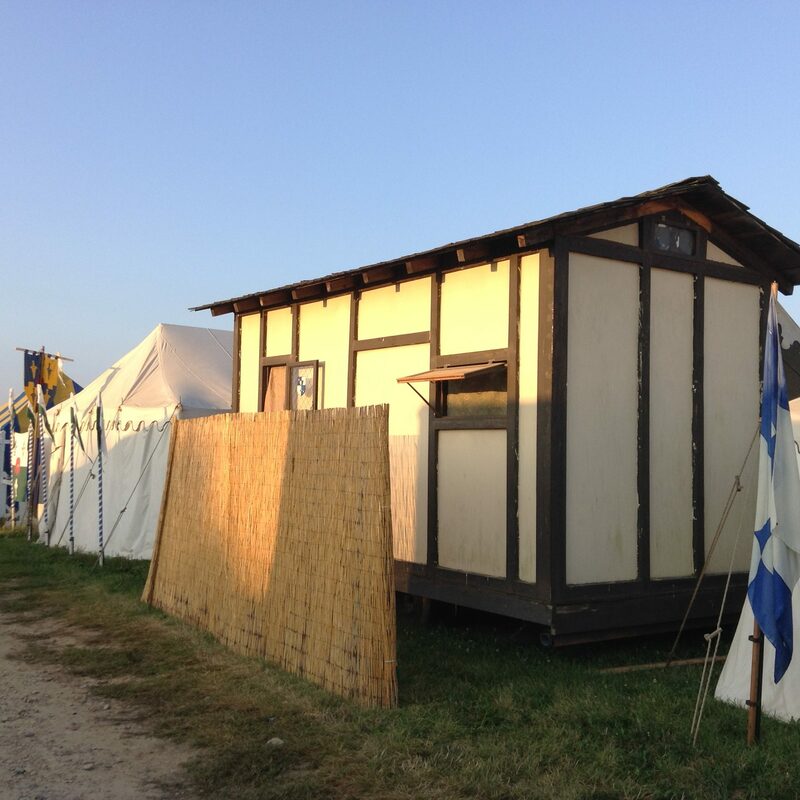 Remember, many of us are living at Pennsic for a full two weeks. Comfort and sanitation are a good thing. Next Time: What else can Vardos and trailers be used for?